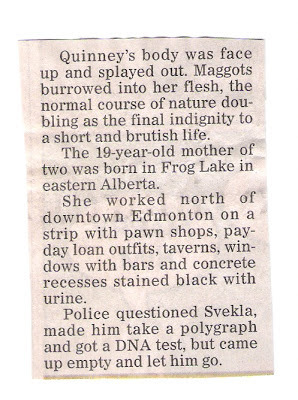 Red Deer Advocate, May 24th, 2008. This prostitute, as is probably the case with most, did not enter into her line of ‘work’ without a history of abuse driving her to it. But in Canada, more than in anywhere else in the whole world, there was opportunity for her to break free from her degrading, dangerous lifestyle. No matter what her unfortunate past, and no matter why she came to this gruesome end before another chance for better, the sad truth is that the outcome here written, both in the clip and in the Bible verse, is irreversible. “There are the workers of iniquity fallen: they are cast down, and shall not be able to rise” (Psalm 36.12.) This is a fact to take note of, not for gloating, as if her end cannot become our own, but for self-shaming, because we all deserve the end that she came to. Most of us look down on prostitution as a sin too low for us to stoop to. But practically none of us can claim to have had no dealing with the ‘loan outfits,’ ‘pawnshops,’ or ‘taverns’ that the vice of prostitution is a sister to. And every one of us is crawling in the flesh with the sins that draw people to these miry places. Who has never been lazy? That sin will march you, instead of to work, to a pawnshop with your belongings. Who has never taken advantage of the weak? That sin agrees with owning one or shopping in one. Who has never been lusty? A lusty mind is a tavern of its own. Oh, we could never live so fast and low as to be found eaten by maggots! Think again, for our lives are short and brutish enough! The worms will get us in the grave if not before. And this is not all. There is that worm that dieth not: “where their worm dieth not, and the fire is not quenched” (Mark 9.44.) This speaks of the everlasting gnawing of hell for every sinner who decides to hang on to his sin instead of letting it hang on Christ, the Saviour of Sinners. You know, the Scriptures do say that the harlots were famous for entering the kingdom of God in Jesus’ day. “Verily I say unto you, that the publicans and the harlots go into the kingdom of God before you. For John came unto you in the way of righteousness, and ye believed him not; but the publicans and the harlots believed him: and ye, when ye had seen it, repented not afterward, that ye might believe him” (Matthew 21.31, 32.) 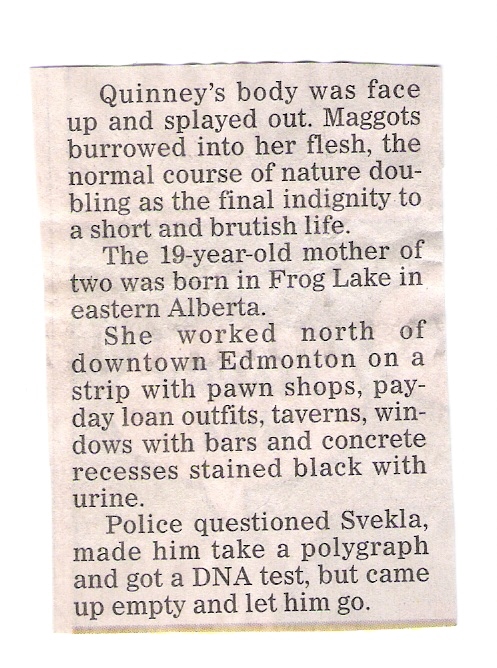 I cannot speak so optimistically about the harlot in this newspaper article. That she repented before being cast down is doubtful. Only God knows for sure. However, many respectable, moral persons will find themselves shut out of heaven while some, at least, of the prostitutes they looked down upon will be waved on in. It depends on trusting Christ or not with the sins you leave behind. From your limited perspective, eternity hinges on that one thing. This is what you must be concerned with. Jesus Christ was sent to be the propitiation, or satisfaction, to God for sins (1 John 4.10.) But where no repentance is, no satisfaction applies. This is why warnings about hell abound in the Scriptures.